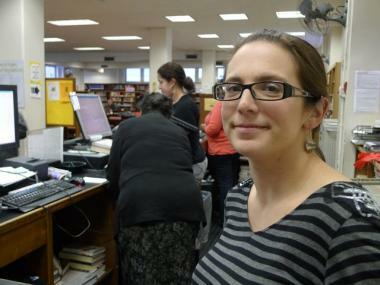 Bloomingdale Library manager Rebecca Donsky says she sometimes feels threatened by unruly tweens who come to the library to make trouble. UPPER WEST SIDE — An Upper West Side librarian says unruly tweens have become such a threatening menace to her and her staff that she needs police protection. "They're 12 and they have no respect for us," said Bloomingdale Library manager Rebecca Donsky at a recent 24th Precinct Community Council meeting, her voice shaking with emotion as she pleaded for help controlling the youngsters. Donsky said she asked her husband to get her pepper spray because she's worried the pre-teens might jump her one night as she's locking up at the end of a shift. She's regularly forced to kick out rude tweens, who have called her "b--ch" more times than she can count, Donsky said. Staff at the Bloomingdale Library say they need police help to control unruly tweens who harass library employees. "I'm afraid," Donsky said. "Kids wait outside and one of these days they're going to be waiting for me." Donsky, 28, says she's "suburban girl from Staten Island" who has a hard time cracking down on kids. "I have a big squishy heart, so it's really hard for me to put my foot down," Donsky said. "That's why I'm asking for all this help [from police]." 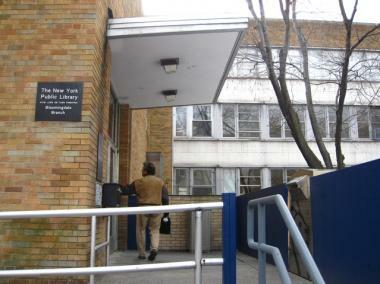 The Bloomingdale Library on West 100th Street and Columbus Avenue is directly across the street from the NYPD's 24th Precinct. But even with police nearby Donsky said she worries about her and her staff's safety. Donsky says most days at the library are busy, but manageable, with dozens of kids streaming into the branch after school. Many are quiet and polite, but some bad apples come looking for trouble, she said. She's worked with investigators from the library's security team and legal department to identify a few troublemakers and ban them from the branch. In December, a group of rowdy, noisy teens refused to leave the library, even when the security guard asked them. Donsky walked across the street to the 24th Precinct and asked police for help. As two officers escorted the teens out of the building, the young people shouted at Donsky and told her to "go to hell." Later that day, Donsky called 911 when she spotted the same group of teens loitering outside the library doors. "I felt silly calling 911 for a bunch of kids loitering on the porch, but technically they were trespassing," Donsky said. The officers who responded to the call told Donsky they sympathized with the librarian, because, they said, teenagers don't respect police. "They laugh in our face," one officer told Donsky. Deputy Inspector Kathleen O'Reilly, commanding officer of the 24th Precinct, told Donsky at a recent 24th Precinct Community Council meeting she would step up police visibility by sending officers to walk through the library when they're leaving the station house on meal breaks. 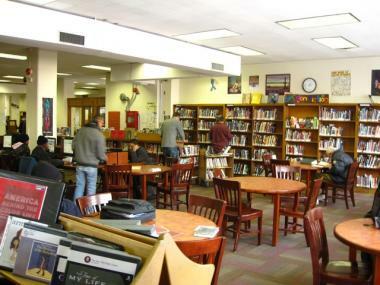 New York Public Library spokeswoman Angela Montefinise said disruptive behavior isn't acceptable, and the library has worked with its own security team to improve the situation at the Bloomingdale branch recently. Librarians at the Bloomingdale Library on West 100th Street say they need police help to control unruly tweens who harass library staff. Bloomingdale Library is also making efforts to become more welcoming to young people, Montefinise said. The library is creating a new space in the branch just for teens, and it's about to start a talent show program that teens will direct. "The goal is to find productive and positive ways to bring teens into the library," Montefinise said in an e-mail. Donsky, who focused on youth programming when she got her master's degree in library science, says she "loves teens" and wants them to enjoy the library. "I want to give them a way to channel their energy," Donsky said. "If they're angry, don't call me names, write a poem."